Governors from three meat-producing states today defended Beef Products Inc., the company that makes lean finely textured beef, which now-former USDA scientists nicknamed "pink slime," after a walk through the company's plant accompanied by ABC News. "Let's call this product what it is and let 'pink slime' become a term of the past," Texas Gov. Rick Perry said after the tour, after which officials showed off t-shirts with the slogan, "Dude, it's beef!" Stung by consumer reaction to the process used by BPI, grocery stores pulled beef containing the filler off the shelves and BPI closed three of its four plants for lack of demand. The governors said that the treatment the product received in the media was unfair because it is not only safe, but also nutritious and allows grocers to sell leaner ground beef at a lower cost. "It's beef, but it's leaner beef which is better for you," Iowa Gov. Terry Branstad said. "We take this off the market then we end up with a fatter product that's going to cost more and is going to increase the obesity problem in this country." ABC News joined Branstad, Perry and Kansas Gov. 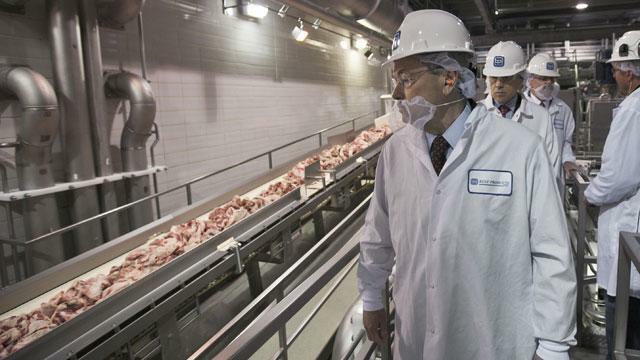 Sam Brownback on a tour of the facilities where beef scraps, mostly fat and connective tissue, are processed. The scraps are put through centrifuges to separate the fat and then through pipes, where they are spritzed with ammonia gas before emerging as a pink mix that is then frozen and sent all over the country. Until recently, the lean finely textured beef, known to critics as "pink slime," was added to America's fast food, school lunches and 70 percent of all ground beef sold at grocery stores. Click here to find out where you buy pink-slime-free beef. ABC News was not allowed to ask questions during the tour, but at a news conference later, the governors went on the attack. Branstad, who received $150,000 in campaign contributions in 2010 from the founders of BPI, organized the governors' tour and press conference, but told ABC News that the contribution played no role in his decision to hold the event. "I always fight for my constituents and I will always fight for what is right," he said. Nancy Donley, president of Safe Tables, an organization dedicated to preventing foodborne illness, lost her 6-year-old son in 1993 from E. coli. Donley warned that doing away with lean finely textured beef will make the meat supply more dangerous. The Safe Tables website until recently listed BPI as its largest funder, providing more than half the organization's budget. However, the disclosure of BPI's funding recently was removed from the website, with Safe Tables saying the donor now wishes to be anonymous. The relationship was not mentioned at today's news conference or in a recent ad in the Wall Street Journal in which Donley defended the company. "No price can be put on my son's head," she said today. "I can't be bought and neither can my organization. We represent the victims." Also on stage for the news conference was the Dr. Elisabeth Hagen, under secretary for food safety at the USDA. Hagen assured the public that the product is safe to eat, but still refused to answer any questions from ABC News after the news conference. ABC News has been asking to speak with Hagen for three weeks, but she has declined to speak, claiming a tight schedule. BPI founder Regina Roth concluded the press conference by inviting the governors to chomp down on BPI-provided burgers complete with the lean finely textured beef they were defending and which the "pink slime" critics want clearly identified on packaging. "We're going to have some burgers with LFTB in them, so come on in and let's go eat," she said.